The Office for Sexual Violence Response, Support and Education (O-SVRSE) is hosting #ConsentMcGill, an annual campaign which creates dialogue about and increases the understanding of consent, healthy relationships, and sexual violence prevention, from September 24th to October 5th, 2018. As part of the numerous events and activities happening during this campaign, "Let's Talk About Consent Culture" is a free three-hour workshop aims to provide a space to talk, learn, and ask questions about sexual consent, healthy relationships and other sexuality topics. The workshop will be held by Chloe Garcia, PhD candidate in the Department of Integrated Studies in Education, Senior Research-Assistant and Lead PhD mentor for IMPACTS, and Graduate Student Representative for the Implementation Committee for the Policy Against Sexual Violence at McGill University. 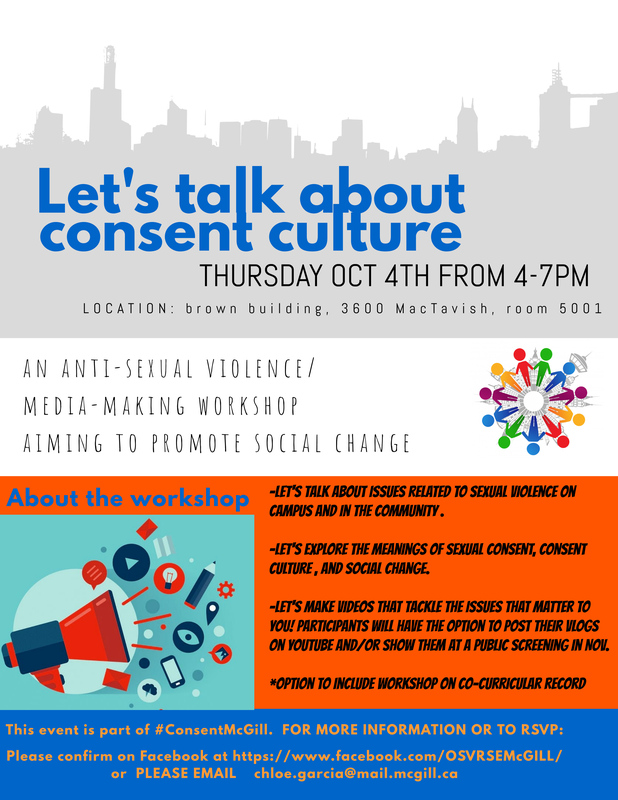 In this workshop, we will discuss current barriers to ‘consent culture’ and the change that is needed to break these down. As the main activity, workshop participants will have the opportunity to speak about what matters to them by designing and shooting short vlogs (video logs) on consent and consent culture. Participants will have the option to post their vlog (or future vlogs) on a YouTube channel and submit their vlog to a film festival entitled “Let’s talk about Consent Culture”, held in November - neither is mandatory to participate in this workshop! The event will be held in Room 5001 of the Brown Student Services Building on Rue McTavish. No equipment is needed, all necessary materials will be provided.